Being an excellent tool for activism for the promotion of veganism, it can be seen in demonstrations around the world and in various exhibits whose aim is one – the total liberation of all animals. 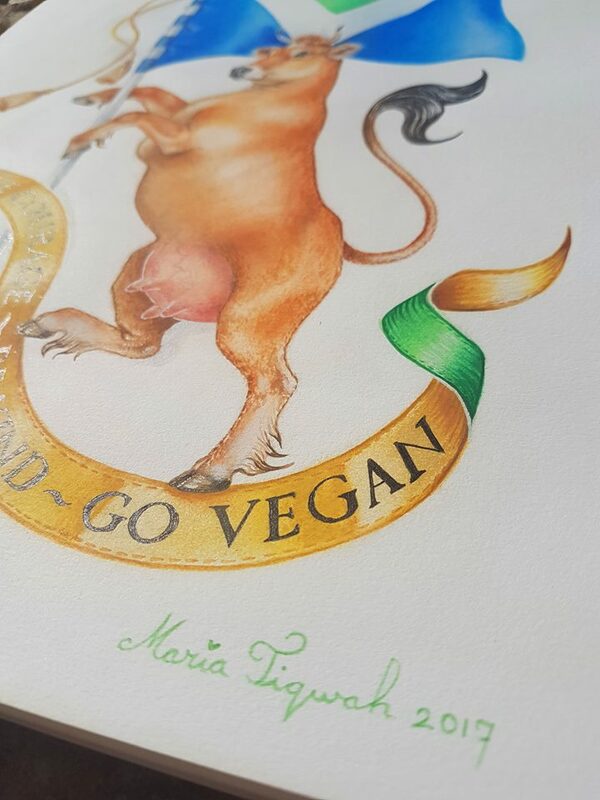 Among all the products and items that have been made, the artwork of the Dutch artist Maria Tiqwah, who with her great talent created the coat of arms of the vegan flag, is particularly striking. In a long correspondence about the coat of arms with Maria, I got to know her amazing personality and was exposed to her works, all aimed at a better world for all people and animals. I would be happy if you could tell a little about yourself. I am a happy vegan of 35, born in The Netherlands and living in Istanbul (Turkey) with my husband from Iraq and our 4 cats. Good words to describe me might be creative, colourful and a bit odd. Animals are my number one inspiration. My parents attic lies full of my drawings since I could hold a pencil, and… they are all animals. My mother even told me my first word was ‘cat’ and my second word was ‘fish’. Although I always saw myself as an ‘animal lover’, when I went vegan in 2011 ‘animal lover’ got a different meaning and I wanted to help the animals. A year later a quit my job and started my own green advertising agency and worked for clients like the Dutch political Party for the Animals, The Vegetarian Butcher, Animal & Rights, and many other animal charities. Besides my advertising work, painting animals has always been a passion. Another source of inspiration is nature and the beautiful old buildings with baroque details here in Istanbul. 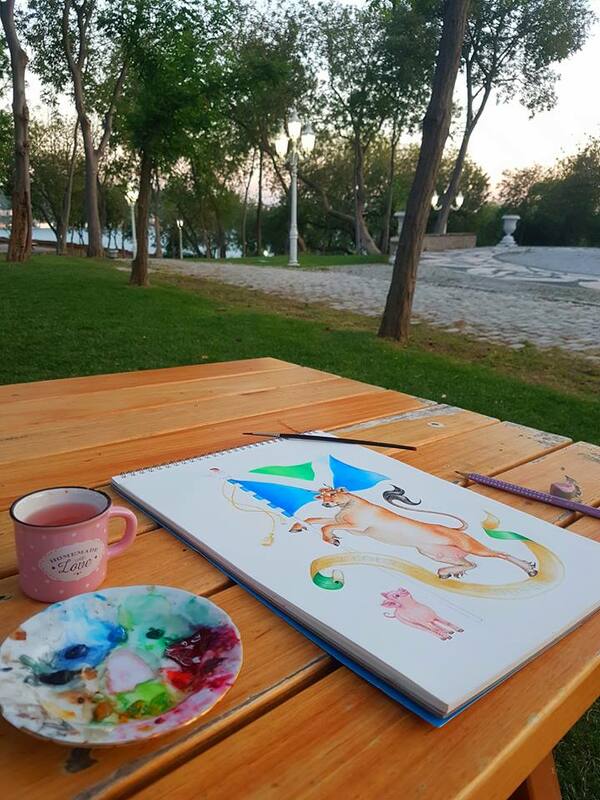 I live near the Yildiz Park, which once was the garden of the Yildiz Palace. It’s my favorite spot to relax and study nature. What brought you to draw the coat of arms? 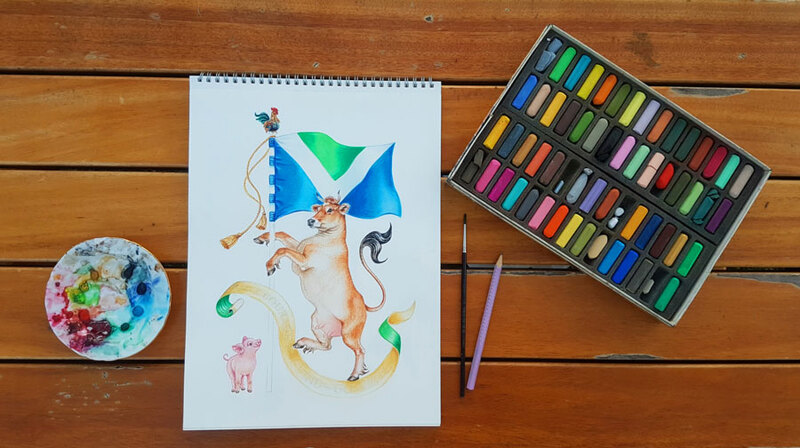 What technique have you used for painting the coat of arms? I used vegan materials: soft pastel, watercolour, black fineliner and white gel pen on paper. I love soft pastel because of the bright colours. Watercolour is great for sharp details like the hairs. I used the black fineliner for the text and the white gel pen for white details like the lights in the eyes. Do you think art for animals can be a form of activism? Yes, absolutely! For example in Turkey pigs are generally seen as ‘dirty’. But when my art teacher showed my piglet painting, the whole class was smiling and said ‘awww, so cute!’ Images can change minds. 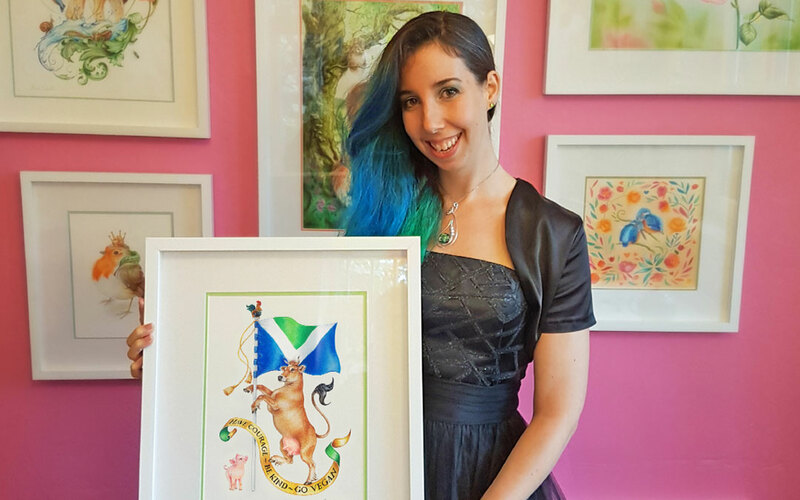 With my animal paintings, I want to let people look at animals through my eyes. I want to show them as unique personalities who can feel emotions, pain, and pleasure just like us. I would love to encourage all vegans who enjoy making any kind of art, to express their feelings and views about animals through their work. 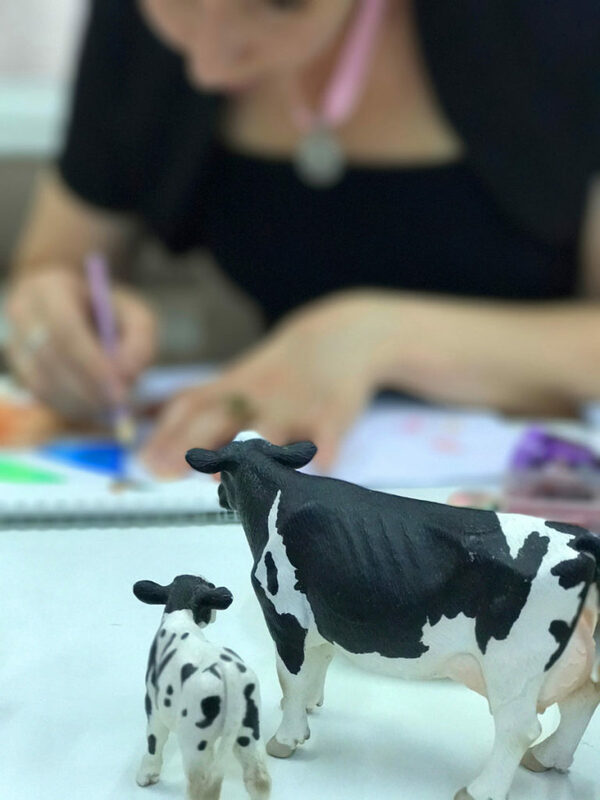 Here are some interesting links: Aisha Ponders about art as vegan activism, making art for vegan charities, and vegan art from around the world. Where can we find more of your works? and in my webshop (worldwide shipping). I am still working on my artist website and will take commissions.